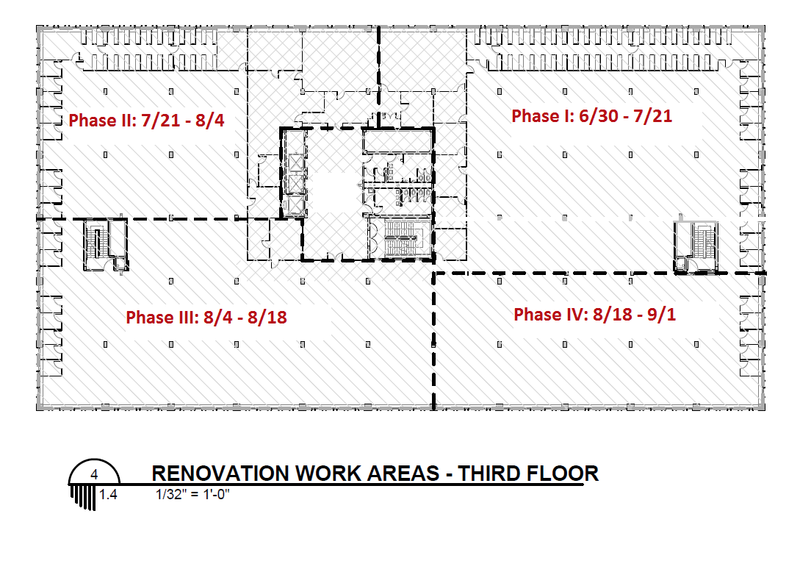 The contractor for the construction project has issued a new phasing schedule for the installation of the fire suppression (sprinkler) system on the 3rd floor. 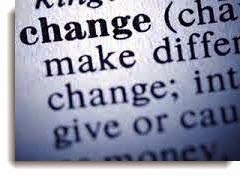 It corresponds with the change in the sequence of the work announced last Wednesday afternoon. The schedule shows a new sequence for all the work phases on the floor and adjusts the dates for each phase to account for the recent delays related to pipe requirements for the sprinkler system and to the abatement work completed on the 3rd floor at the end of last week. 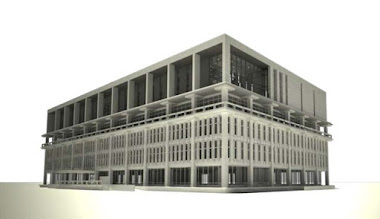 Rather than move across the back side of the building to the southwest quadrant of the floor, the sprinkler installation work was shifted to the northeast quadrant of the building more directly adjacent to the Phase 1 stacks area where the book shelves were first covered on June 30. Once the installation work is completed in the new Phase 2 northeast quadrant, the work will zig zag back up to the southwest quadrant that houses music books and scores for Phase 3 and then end Phase 4 in the southeast quadrant of the floor sometime around Sept. 16 which is about two weeks later than initially planned. 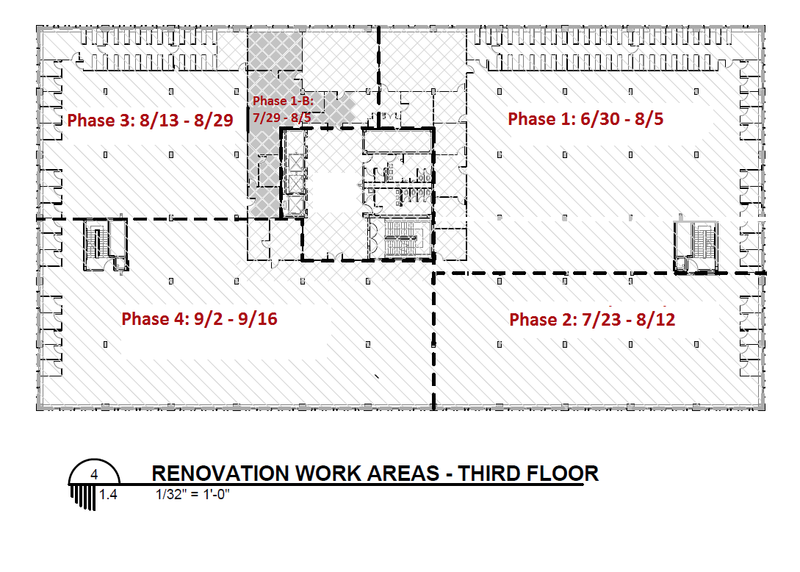 The area of Phase 1 has been extended into the Innovative Learning Center (ILC) office area next door, since otherwise the work there would have been pushed back into the early fall semester. The ILC is going to use classroom 308 for a storage area for the sensitive equipment from its office area during the sprinkler work as had been planned originally. Meanwhile, classroom 309 is back in service although for the remainder of this week its best access may be through its side door while a crew reinstalls the ceiling in front of 309’s normal doorway entrance. There has been a quick change in plans in the phasing of the installation of the fire suppression (sprinkler) system over the book shelves on the 3rd floor. Rather than move to the Phase 2 area, which is in the southwest quadrant of the floor that houses music books and scores, the installation has been shifted to the Phase 4 area that is located in the northeast quadrant of the building and more directly adjacent to the Phase 1 stacks area where the book shelves were first covered. Workers are already putting up plastic sheeting in this new Phase 4 quadrant and removing the plastic sheeting that was put up yesterday in the Phase 2 area. The abrupt switch was made early this morning because the subcontractor handling the sprinkler system installation lacks all the pipe necessary in the Phase 2 area where actual conditions above the ceiling including plumbing and ductwork differ significantly from the construction plans, which were based on the original 1960s era plans for the building. Conditions above the ceiling in the northeast quadrant of the building are much more standard and the pipe required there is onsite. The switch will help avoid delays in the work on the 3rd floor overall while the pipe with adjusted dimensions for Phase 2 can be obtained. The switch does complicate the sprinkler pipe installation in the area in the area straddling Phases 1 and 2 that includes classrooms 309, 308 and some adjacent offices, and where there were already other complications. The sprinkler installation has now been completed in both classrooms, but the Innovative Learning Center (ILC) office area is in the Phase 2 area that has been delayed. Project managers and the contractor are working to identify some options for an alternate work scenario there that are least disruptive for staff in the ILC and their plans for the upcoming semester. A new phasing schedule with the sequence adjustments described above is expected to issued soon, within the next day or so. Library users will still be able to check out books from covered stacks areas by using the "Make a Request" feature in the online library catalog, with the standard 24-hour (weekdays) turnaround provided for access to materials in other restricted areas such as our off-site facility. These requests can also be made directly, in-person, at the Circulation Desk in the Learning Commons on the library's 1st floor. Access to the covered books will be restricted to library staff. The contractor for the construction project has completed the installation of the fire suppression (sprinkler) system over the book shelves in the northwest quadrant of the 3rd floor. Plastic sheeting in this Phase 1 area of the 3rd floor stacks has now been completely removed. 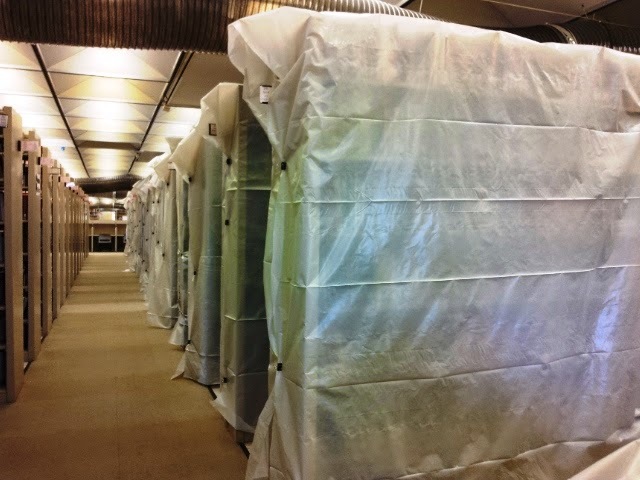 Crews today began to cover the books stacks in the Phase II area, which is the southwest quadrant and the area that houses music books and scores. Overall, the sprinkler installation project on the 3rd floor is proceeding roughly on schedule, with exceptions. The primary exception is in the area straddling the two phases that includes classrooms 309, 308 and some adjacent offices. Work there is a few days behind due to the code-required removal of a portion of the flat ceiling in the hallway and above a small closet near the Innovative Learning Center (ILC)/Center for Library User Education (CLUE) receptionist’s desk; this is being handled by an abatement contractor. There is some asbestos enclosed within the core of the ceiling material in that location so the ceiling itself is being removed and replaced because the subcontractor installing a sprinkler line there would otherwise have to drill through it. This operation, which is set to start tomorrow, should be finished in less than 48 hours. Workers have completed the sprinkler installation in Classroom 309, which may be returned to use near the end of this week. The contractor hopes to be out of the ILC/CLUE area as a whole before the end of the month. The sprinkler line installation in the bibliographers' offices nearby has been completed and these offices should be returned for use this week. Library users will still be able to check out books from the covered stacks in the Phase 2 area on the 3rd floor by using the "Make a Request" feature in the online library catalog, with the standard 24-hour (weekdays) turnaround provided for access to materials in other restricted areas such as our off-site facility. These requests can also be made directly, in-person, at the Circulation Desk in the Learning Commons on the library's 1st floor. Access to the covered books will be restricted to library staff. After Phase 2 the project will proceed to Phase 3 in the southeast quadrant of the floor, probably sometime around Aug. 4. Abatement containment areas near the Dixon side stairwell: On floors 2-3, access to a single row of books directly adjacent to the stairwell on each of these two floors will be blocked by a containment area of plastic sheeting until early next week when some abatement work above the ceiling and within an interior shaft for ductwork there is expected to be completed. The books in these relatively small covered areas will be unavailable for retrieval until the plastic sheeting is removed, likely on Monday. Restroom tile: Workers have completed the tile work in the women’s restrooms on the 3rd and 4th floor, replacing the old tile that had remained on half the wall at the far end in each. There should be no more construction-related closures in these restrooms, except perhaps for a very brief walk-though inspection for the architects and project managers to finally sign off on the work, likely to take place today. Steel: Work on the construction of the frame for the 5th and 6th floors above the library has continued to progress well as has the simultaneous pouring of concrete for the new 6th floor in areas where the framed steel is fully set. Some steel deliveries and concrete pours have needed to be rescheduled due to logistics and weather, but the work above is also moving along roughly on schedule overall. The contractor for the construction project has begun covering with plastic sheeting the book shelves on the 3rd floor in the northwest quadrant of the building. This is to accommodate the first of four quadrant phases of work required to install the fire suppression (sprinkler) system on the 3rd floor, a project that is starting about a week behind schedule. It is similar to the project nearing completion this week on the 4th floor, but more limited in scope since it focuses only on the installation of sprinkler lines and heads and does not include the installation of roof drains and other plumbing work required above the ceiling on the present top floor above. Therefore, on the 3rd floor the installation is expected progress more quickly in shorter phases. The books are expected to be covered and access restricted in this Phase 1 area until July 21, barring any additional delays. Library users will still be able to check out books housed there by using the "Make a Request" feature in the online library catalog, with the standard 24-hour (weekdays) turnaround provided for access to materials in other restricted areas such as our off-site facility. For more information see: http://library.tulane.edu/help/book_requests. These requests can also be made directly, in-person, at the Circulation Desk in the Learning Commons on the library's 1st floor. Access to the covered books will be restricted to library staff.